The Claas Tucano is seen today as a premium machine in the upper mid-size combine segment and has by now been tried and tested for its suitability for many crop varieties and its combination of a high throughput performance and high straw quality. For the 500 series, WIKING took on the challenge of miniaturizing the APS hybrid threshing system. For the new Tucano, for example, the tradition-rich model-makers have functionally designed the highly visible top discharge, which is a great advantage during harvest. 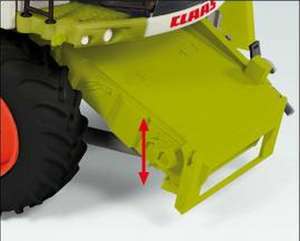 Through this measure for the prototype, Claas has increased the discharge capacity by an average of 30% ? up to 105 liters a second are discharged from the tank. With a capacity of up to 9,000 liters, the grain tank is empty in less than two minutes! The emptying from the top also facilitates accessibility for maintenance work. In combination with longer discharge pipes, it even allows for greater loading heights and widths. In the 1:32 model, everything is true to prototype: The feed for the cuttings is height-adjustable; the associated feed rollers rotate. The side engine covers on the superstructure can be opened right and left. To simulate the emptying of the tank, the discharge spout can be pivoted true to the original radius. Naturally, the grain tank can be opened and provides a view of the movable auger in the interior. In addition, the rear engine cover can be opened and the air intake grille rotates. 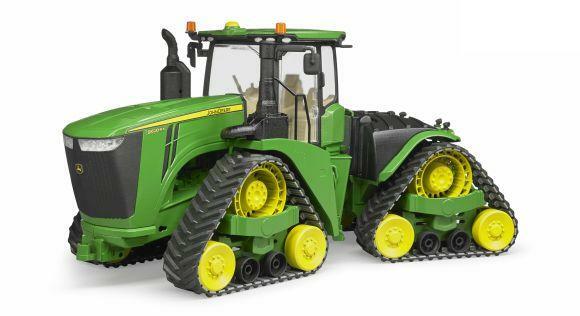 The entire harvester model offers maximum mobility through the rear swing axle, which is also steerable. The fully transparent operator workstation allows inspection of the completely miniaturized harvester operation. The cab doors can be opened. The entry steps on the front of the cab can be pivoted forward as needed; the mirrors can be adjusted as desired. For the first time Wiking has provided safety chains on the front steps; in addition, the lower step is flexibly mounted. Warning signs and taillights can be pivoted for field implementation. 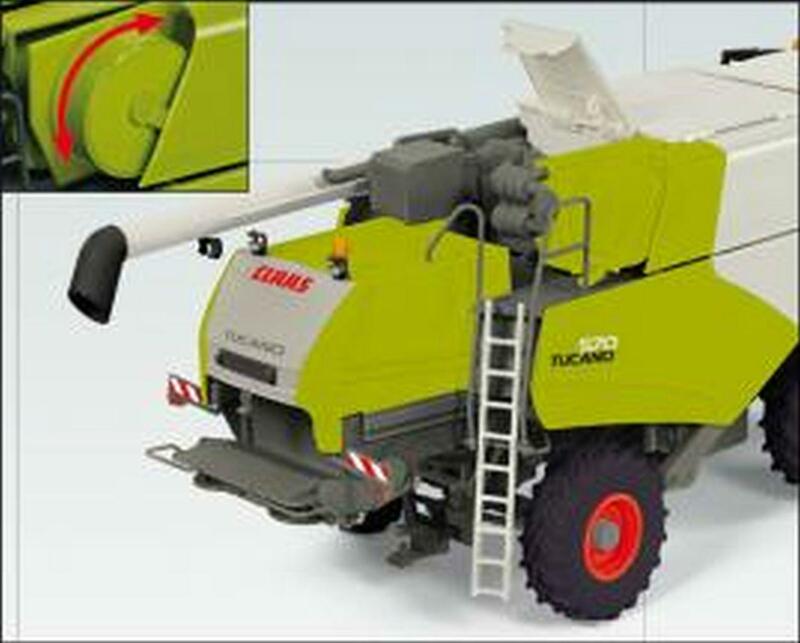 The front-mounted, removable Vario 930 cutting unit has a rotating auger, and the rotor and rotor arms are pivotable. Wiking has made the positioning button so it can be folded in. Moreover, the blades are adjustable. The hinged drawbar swivels by means of a spring return; the front axle can be steered accurately via the fifth wheel. Last but not least, the removable wheel chock delivers proof of the tangible subtlety of the model-building talent of Wiking.